The Vita Rendezvous is a 7 person hot tub with all of the features that you would want from a large luxury 7 seat hot tub with a huge 93 jets including 18 air jets for the maximum in hydrotherapy. Featuring the fantastic Vita wave seat alongside fountains and cascading water features, the Rendezvous is literally packed with gadgets. If you want a large and luxury hot tub that does everything at the touch of a button, the Vita Rendezvous is the perfect choice. Available from Bay Spas with a full delivery and installation service, the Rendezvous is a gorgeous hot tub, perfect for boys that love their toys! 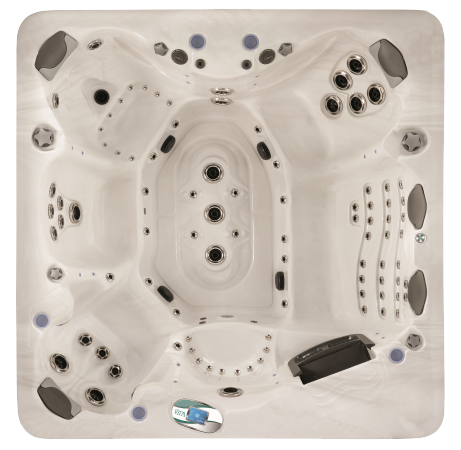 From the surround sound stereo system to M7 heating and 24 hour filtration, the Rendezvous is an ideal hot tub if you need to have an easy to manage tub, big enough for 7 adults and designed to relax in and have fun in. There are a full set of controls on the top side of the tub that also has a great LED lighting system alongside the Bizone water management system. Call Bay Spas now for a full supply and installation package for this stunning hot tub.